Allergy sufferers go to great lengths for relief: nasal sprays, pills, shots, making their spouse sleep on the couch—some are even getting blasted with salt. Salt therapy is not a new idea; halotherapy (the fancy name for it) originated centuries ago and mimics the environment inside a salt cave. Breathing in the salt is supposed to kill respiratory ailments and move the mucus out of your lungs. But even though it is an old idea, recently there has been a bit of a salt renaissance, including the new invention of salt yoga practices. 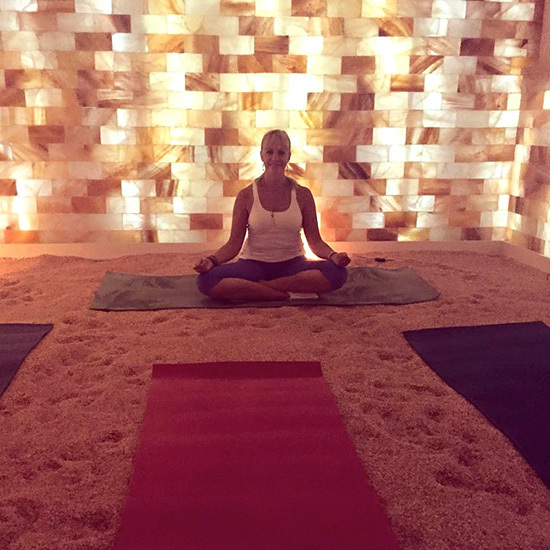 Breathe Easy in New York City combines salt therapy with yoga in an effort to increase its effectiveness and to help patients relax and focus on breathing. The yoga classes do not increase your heart rate like power yoga does. Instead, the poses help stretch the muscles and open your lungs. And, yes, you may be coated in a fine layer of salt by the end, but that happens anyway when you eat a bag of pretzels—and yoga won’t leave you bloated. You can find a schedule for Breathe Easy’s salt yoga here.